M51, also known as the Whirlpool Galaxy, was one of Charles Messier's first discoveries. He found it on October 13, 1773 while observing a comet. The small companion galaxy (NGC 5195) was discovered by Messier's friend, Pierre Mechain in 1781. 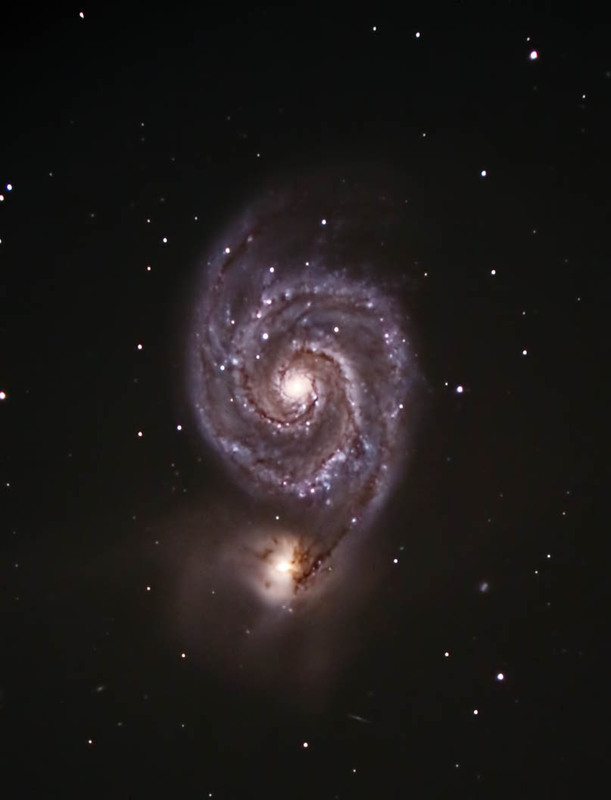 M51's pronounced spiral structure (considered a "grand design" spiral) is the result of its interaction with NGC 5195. This caused compression in its arms, leading to massive star formation. This galaxy was the first to have its spiral structure indentified by Lord Rosse in 1845. Images were focused using the camera' live view function. Subframes were calibrated, aligned, and combined with ImagePlus. The final image was adjusted and cropped in Photoshop. Shot from my backyard observatory in southeastern Minnesota on 3/21/14. Temp: 20F; good seeing.